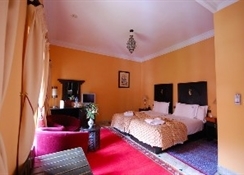 The delightful Les Borjs De La Kasbah is a boutique hotel consisting of six small town houses and one riad. The hotel provides a haven of peace for guests and the architecture is a perfect blend of contemporary refinements and Arabic-Moorish charm; a world away from the busy medina nearby. For those seeking to visit the sights, a number of the most popular attractions are within walking distance of the hotel including the famously atmospheric Jemaa El Fna Square where snake charmers and street performers delight visitors, the Majorelle Gardens, the Palais Des Congres and the Bahia Palace to name but a few. Facilities on offer to guests at the air-conditioned hotel include a lobby with 24-hour reception, a hotel safe, a TV lounge and a range of conference facilities along with a car park and bicycle hire services. For dining, the hotel boasts a restaurant serving traditional Moroccan and international cuisine as well as a cafÃ© or those seeking lighter refreshments and a bar serving guests their favourite drinks. There is also an outdoor swimming pool for guests to take advantage of and a range of massage and spa treatments for those seeking the ultimate in relaxation. Each of the rooms available comes equipped with Wi-Fi connectivity, air-conditioning, minibar TV, phone, safe, desk and a private ensuite with bathtub or shower. This hotel is ideally suited to those seeking a relaxing stay right in the heart of the city, yet away from the hustle and bustle of the busy main roads. 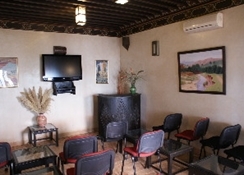 The hotel boasts an outdoor swimming pool and various massage and spa treatments. Each of the rooms available comes equipped with Wi-Fi connectivity, air-conditioning, minibar TV, phone, safe, desk and a private ensuite with bathtub or shower. Certain amenities may be payable locally. There is a restaurant serving a range of traditional Moroccan and international cuisine as well as a bar for those seeking a refreshing drink after a busy day sightseeing. 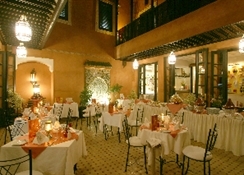 The Les Borjs De La Kasbah is set in the heart of the medina of Marrakech-a city split into the old town and the new town, this cultural metropolis boasts a number of cultural attractions and open-air markets filled with live entertainment. At night the city comes alive, offering exotic food, vibrant nightlife and a truly unique atmosphere.